A hosted, managed and serviced neto eCommerce platform enables small business retailers through to large scale wholesalers, to develop and maintain powerful e-commerce packages that integrate with leading accounting platforms, payment gateways, shipping carriers and sales channels in Australia. 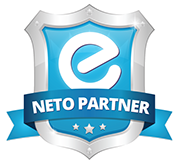 It takes a skilled team to design and integrate Neto quickly and efficiently within your business requirements. We are constantly striving to increase our capabilities and offerings to clients, we have successfully integrated accounting packages (MYOB,Xero…) and shipping carriers with Neto in a seamless way.